British transfer fees officially lost touch with reality on Tuesday 7th February 1922. “When will this folly on the part of football clubs come to an end?” demanded the Football Post. It wasn’t talking about a swap by the big boys of the game – the Sheffield Uniteds or Preston North Ends. More than 90 years on, it’s safe to say that if there is to be a limit, we haven’t reached it. Transfer fees are the stuff of fantasy: more than £1 billion was spent on the trade of players in the Premier League alone in the windows of the 2015/16 season. Since the advent of professionalism in football in 1885, the record price paid for a single player has been broken most years. But in 1922, a Scottish club sat atop the transfer league. It was the first time, and – barring any surprise Qatari-style investment into Forfar Athletic or Cowdenbeath – almost certainly the last time. Sydney Charles Puddefoot, born in 1893, was older than West Ham United itself, the club founded by employees of the Thames Iron Works in 1895. He attended the local Park School – an institution that provided a steady flow of quality to the Hammers over the years – before playing for the amateur Limehouse Town and signing for West Ham in 1912. Over ten years he scored more than 200 goals for West Ham. He was tall, strapping, skilled and a boyhood fan – attributes that continue to give him heroic status in East London where he is mentioned beside the likes of Bobby Moore and Geoff Hurst. If he had stuck around he’d probably have had a stand named after him at the Boleyn Ground. Reg Pratt, a young fan in 1922 who would later become chairman of the club, confessed he was in tears when Puddefoot was sold to Falkirk. There are two versions of the circumstances surrounding his departure: the straightforward one that West Ham spun to the press, and the more complex one that has come to light with the benefit of hindsight. As with today’s football industry, the real reasons for players changing clubs are obfuscated by fans’ concepts of loyalty and wild press speculation. By the 1921-22 season, ‘Super’ Syd Puddefoot was one of the highest-paid players in the squad, earning £9 a week – at that time the maximum allowed by the Football Association. He was the Hammers’ top scorer. But rumours had been circling around the claret-and-blue end of Essex that their asset would soon be on his way out. West Ham’s board had a reputation among supporters of being more interested in matters of the balance sheet than those of the pitch; the reality was that they had spent a total of £35,000 on the development of their stadium, the Boleyn Ground, where they played their last game on 10 May 2016. They played in the Second Division and couldn’t afford not to cash in on Puddefoot’s talent. Club records confirm he submitted a transfer request at the start of 1922, and bids were duly sought from the big London teams: Arsenal, Chelsea and Tottenham Hotspur. News spread north that he was for sale to the right buyer, and the Bairns decided Puddefoot was the man to fire them to success. It wasn’t as random an association as it might first seem. Puddefoot had been stationed in Bridge of Allan, 15 miles from Falkirk, during World War One. The Scottish league had remained active between 1914 and 1918 and the presence of an England international in Stirlingshire had not gone unnoticed by the directors of Falkirk. In those days, the Scottish Cup was the priority (as was the FA Cup south of the Border): winning the league didn’t bring the financial advantage or access to Europe it would in years to come. In 1922 Falkirk had their hearts set on a cup run that many thought could lead to the final, and believed that Puddefoot could provide the boost to get them there. West Ham called the bluff of the Scots, telling them there had been offers in the region of £4,500 for the player. If they wanted him, they’d have to smash the current record, established when David Jack moved from Plymouth Argyle to Bolton Wanderers in 1920. The story goes that a group of Falkirk directors took the train down to London to secure their target, carrying the five grand in cash. They returned the next day, successful but skint, and Puddefoot followed soon after. Adjusted for inflation, £5,000 would be worth about £200,000 today – the very top Premier League players’ weekly wage. The Football Post claimed he was met by approving crowds at the station upon arrival in Falkirk, which cheered him “all the way to his lodgings”. Scottish clubs at the time were playing a more progressive, passing game than the rowdy kick-and-rush favoured in England; it was just six years later in 1928 that the fabled Scottish ‘Wembley Wizards’ dazzled crowds with their intricate ballplay and out-passed England to a 5-1 victory in the British Home Championship. Back in Scotland Puddefoot’s moment on the big stage had arrived. Falkirk, flying high in the first division and with the most expensive footballer on the planet leading their line, had been drawn against second division Bathgate – who had been playing in the amateur leagues just two years earlier. 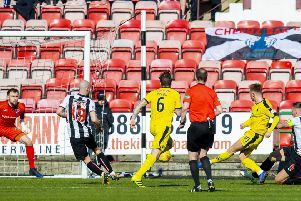 The question for the Falkirk faithful – who made up the bulk of the 10,000 spectators – was not the question of the win, but the margin. The minnows had other ideas. Despite the best efforts of their new star, Falkirk unexpectedly lost 1-0. The early blind optimism of the fans gradually began to give way to a more realistic view of the new signing: perhaps he wasn’t the one who would bring the cup home to Falkirk. Over time the world’s most expensive footballer found a new antagonism emerging at his adopted club. Puddefoot believed it was his pedigree not his price tag that alienated fans and fellow players. He even complained that his team-mates wouldn’t pass to him. The main advantage of his move north, he added, was the fact that he had reduced his golf handicap. In a deal possibly brokered to make Puddefoot less homesick, his younger brother Len moved to Falkirk for a month’s trial at the start of the 1922-23 season. He can’t have made too much of an impact – despite a debut performance praised under the headline “Good Work by the Brothers Puddefoot” in the Falkirk Herald – as he only played two competitive games. If the presence of Len was intended to keep Syd content in central Scotland, it didn’t work. Puddefoot elder returned to London at any opportunity, once missing the Infirmary Shield game against East Stirlingshire, and managing to turn out for Essex County Cricket Club – where he was a highly regarded batsman – every summer. Even without the assistance of his team-mates, Puddefoot still managed 45 goals in his three seasons at Brockville but never lifted any silverware with Falkirk. His unhappy spell ended in February 1925 when Blackburn bought him for £4,000 – not a bad bit of business by the sellers, considering he never lived up to expectations. Puddefoot’s unhappy period at the pinnacle of football’s money mountain did not herald the end of his time in the limelight. He won his first England cap in 1925 and lifted the FA Cup with Blackburn in 1928, scoring the opening goal in the first minute of the match by reportedly pushing the Huddersfield Town goalkeeper into the net with the ball in his hands. A decade after leaving West Ham, Puddefoot returned at the age of 37 in a vain attempt to prevent the club being relegated from the first division. He retired the following year having scored more than 200 goals then moved into management, becoming one of the few Englishmen to manage abroad, at Turkish clubs Fenerbahçe and Galatasaray. He returned to England following a brawl at Galatasaray which saw 17 players suspended and Puddefoot “badly man-handled”. His footballing career wound down at Northampton Town, where he coached from 1937 until the outbreak of war in 1939. The story of why Falkirk spent so much money on Puddefoot is very much of its time, but it carries fascinating parallels to the modern game. No one in 1922 could have contemplated the recession-proof blank-cheque beanfeast the football transfer market has become, but even the Puddefoot sensation was short-lived. By the end of the decade, David Jack (him again) had set a new standard with his £11,000 transfer from Bolton to Arsenal. These transactions represented the early stages of a progression that took in the likes of Cruyff, Maradona, Shearer and Cristiano Ronaldo, culminating in 2016’s £89 million sale of Paul Pogba to Manchester United. And how many of those record signings struggled under the weight of expectation that their huge transfers brought? When the transfer window opens again and the folly begins afresh, consider how many footballers could read the story of Syd Puddefoot and feel not a little empathy.